Since shortly after its beginning, the preeflow® brand has collaborated with English distributor Intertronics. Intertronics distributes robots, various dispensing and dosing systems for fluids, and related accessories. To date, the two companies have met mostly at exhibitions or at the ViscoTec headquarters. This year, it was a priority for the preeflow® team to travel to England, get to know Intertronics and all of their employees, and discuss current issues. This visit was combined with a visit to the FAST Exhibition, a small tradeshow held at Silverstone Circuit. Intertronics managed to gather all employees in their office, despite sales representatives normally being away on customer visits. At their request, ViscoTec gave a short training session about their different dispensers and dosing controls. Afterwards, application examples were discussed from the working experience of Intertronics. Furthermore, Team preeflow® had the opportunity to get to know a customer personally and to share experiences with preeflow® products. Intertronics and ViscoTec will support each other more intensively with reports and examples in the future. 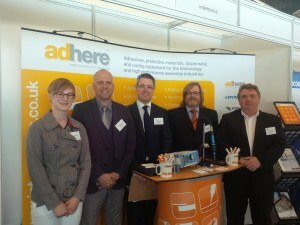 The next day, Intertronics was an exhibitor at the FAST Exhibition at Silverstone. The smallest eco-PEN was presented at the stand. A minimum of two Intertronics representatives were constantly engaged in conversations with fair visitors who showed a keen interest in Intertronics. Shortly before lunch, the managing director of Intertronics gave a seminar entitled: “Adhesive & Coating Dispensing – Meeting the Challenges of Technology Manufacturing.” In this highly successful presentation, he explained crucial points to consider when choosing a suitable dosing system, as well as key influences on successful dosing. Various dosing technologies, their predecessors and ViscoTec’s innovative pressure sensor flowplus® were presented. There were more participants at the seminar than chairs! Most of the participants came to the stand afterward to request advice and further information. Altogether, the visit was very profitable. ViscoTec hopes to welcome some of Intertronics employees to Töging soon.